New Basic Training Hardens 'Softer Generation' The U.S. Army is overhauling its basic training program for the first time in 30 years. Part of the shift is intended to train a new generation of soldiers whose experience with fighting is usually limited to video games. 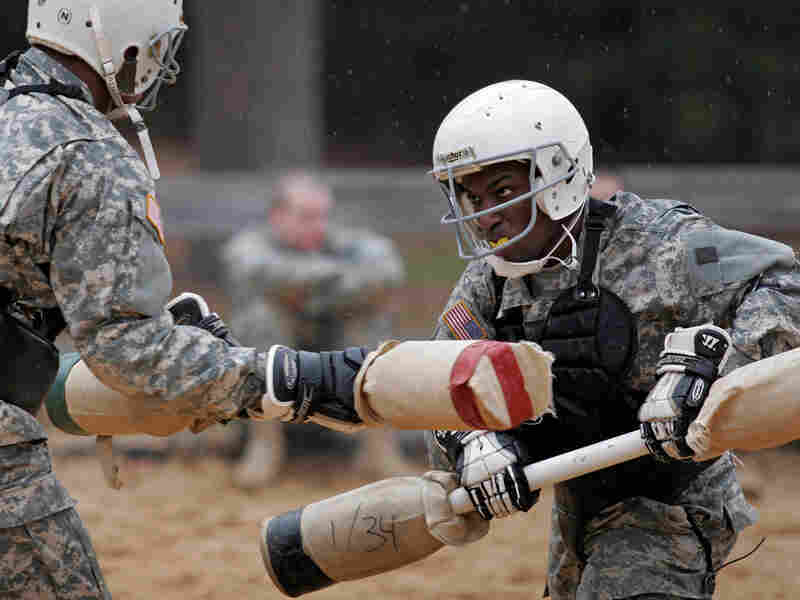 Pugil stick training at Fort Jackson in Columbia, S.C., is part of the Army's overhauled basic training program. The U.S. Army is overhauling its basic training program for the first time in 30 years. The military says the change is necessary to keep pace with the new realities of war in Iraq and Afghanistan, but that's not the only reason. Part of the shift is intended to train a new generation of soldiers whose experience with fighting is usually limited to video games. Lt. Gen. Mark Hertling tells NPR's Scott Simon the military is learning how to mold recruits from the millennial generation. They're "advanced in terms of their use of technology, and maybe not as advanced in their physical capabilities or ability to go into a fight. So we're taking that into consideration as well in doing this holistic review." You might expect a doctor to use the word holistic more than a military man, but that may reflect a troubling trend that Hertling says the Army's been watching very closely. "We are seeing a decline across the board in America," he says. "This isn't a decline in our recruits; this is a decline in our American society in terms of their physical capacity. It's just a softer generation. "But we can't afford to accept that," Hertling says. "We've got to train soldiers to climb the peaks of Afghanistan." It's not just a fitness issue, either. "We certainly have a generation that is not as disciplined when they enter the military." "Whereas they might have what they believe is a form of courage or discipline, it's not what we expect of a soldier in very tense and difficult situations," Hertling says. In some ways, that means basic training needs to get — well, more basic. The new regimen spends even more time on how to fight. "It's including things like the use of weapons, knives, bayonets, sticks — even the rifle can be used as a weapon without shooting it," Hertling says. Hand-to-hand skills like kicking, punching and holds are preparing recruits for close combat, which, he notes, are the kinds of situations the military is expecting to "be in for a very long time." They may need to spend more time toughening up, but Hertling says, today's recruits also bring skills and an attitude that the military's not seen before. "They're different. They have a technology edge. I think they're smarter than any generation we've ever had before," he says. "They certainly ask a lot more difficult questions." They have loyalty, Hertling says, but he thinks the most important thing about this generation is that they want to change the world. "They want to contribute to something that's bigger than themselves."